In many countries, the trend-setting 5G network is still only on paper. But so that we can all soon benefit from the new mobile radio standard, manufacturers like Samsung, Huawei and Motorola are already launching the first smartphones with 5G modems for testing purposes. The Chinese manufacturer OPPO even goes one step further and is already producing its first over-the-counter smartphone, the OPPO Reno 5G, for its partner Swisscom in Switzerland. Samsung and Huawei announced the first 5G smartphones at the Mobile World Congress 2019 at the end of February. But both the Samsung Galaxy S10 5G and the Huawei Mate 20 X 5G can currently only be purchased in countries such as South Korea (Galaxy S10+ 5G) or, in the case of the Huawei Mate 20 X, not yet as end consumers. OPPO, however, shows Samsung and Huawei how to do it right and is already playing the 5G muscles in Switzerland with their partner Swisscom. The proximity to Qualcomm is certainly helpful. This saves the smartphone brand, which belongs to the BBK Group, from having to develop its own 5G modem. Instead, OPPO can concentrate on what's around it, while Qualcomm provides the SoC with the appropriate 5G modem. OPPO expects the 5G network to be very useful, especially because of the extremely short latency time and the fast download speed. The OPPO Reno 5G will benefit from the speed advantages of the new network for applications such as IoT, cloud gaming or simply photo video applications. But that alone won't be enough, because if the necessary applications aren't there, the shorter latency and higher data throughput won't help. OPPO has already started to support numerous game manufacturers in implementing top games for 5G cloud gaming. In addition, work is already underway on an open IoT platform. The spearhead of OPPO and certainly also for the two other smartphone brands in the BBK Group will initially be the Reno 5G. This smartphone is equipped with everything the high-end smartphone fan desires: the latest Qualcomm Snapdragon 855 with 8 or 12GB RAM and the X50 modem. 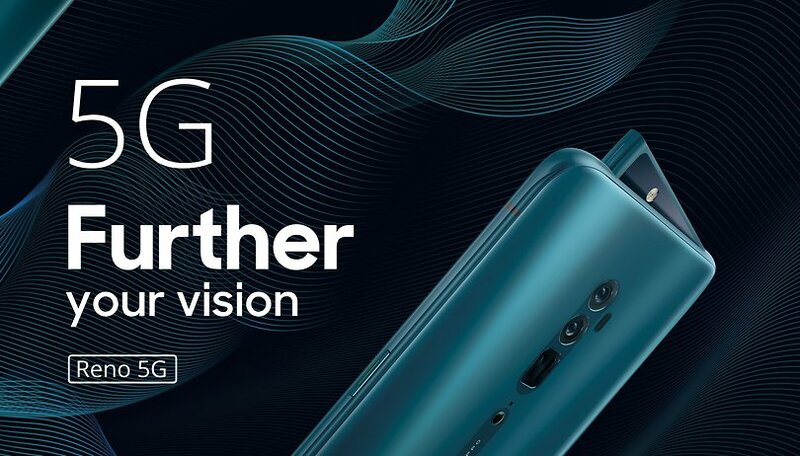 In addition, there is the periscope camera with tenfold hybrid zoom recently presented at MWC 2019, coupled with a 120-degree wide angle and a main camera with Sony's 48-megapixel IMX586 sensor. If the 4.065 mAh battery of the OPPO Reno 5G runs out of power, it charges via VOOC Flash Charge 3.0 with 50 watts as fast as an arrow. In Switzerland, OPPO will launch the Reno 5G with its partner Swisscom in May. It will cost 999 Swiss francs there, but it should not stay with this one market, because OPPO will successively open up more markets for itself as it rides the 5G wave in the coming months. Which ones are lined up, however, will not be revealed for the time being.